Last night I went back through my calendar and counted up the number of live theatre shows I watched in 2013. I counted 48. Forty-eight different shows!! I saw some of them more than once and so I definitely saw over an average of one show a week. Am I fortunate or what? I’d like to highlight some of my favorites from this great year of theater. First, I was lucky to see some great ensembles work together. 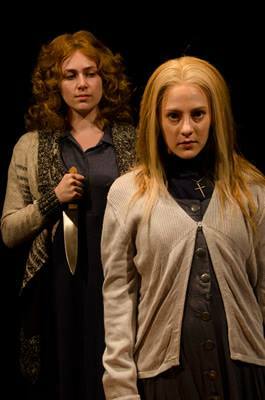 The cast of “Red Light Winter” at the Clifton Performance Theater, for instance, were seamless and made this powerful script come alive with raw naked emotion. Mindy Heithaus brought me to tears, Jon Kovach evoked such anxiety and sadness, and Carter Bratton enraged me. It was powerful and after I photographed it, I went back and saw it two more times. “Light Sensitive” at Mad Anthony Theater in Hamilton was a hidden gem and one that I almost skipped. I was blown away by the work of Daniel Britt, Burt McCollum, and Bekka Eaton in this very sweet and well written little play. More recently, I thought “Wild Party” at Wright State was really well done. The music was fantastic and the entire cast worked to support one another and allowed their co-stars to shine when it was their turn to do so. The cast of “When the Rain Stops Falling” at the KNOW Theater also impressed me with the way they all worked together to tell a multi-generational story with no really weak link. It was refreshing to see Miranda McGee in a more serious role because when she plays Santa Claus in “Every Christmas Story Ever Told” at the Cincinnati Shakespeare Company she’s so funny its hard to imagine her not doing comedy. The rest of the small cast (Sara Clark, Billy Chace, and Justin McCombs) round out the best holiday ensemble in town and you still may have time to see it if its not sold out! I was impressed with a quite a few lead actors and actresses this year, too, especially at CCM. Emily Schexnaydre stole the show in her brief appearance in “Three Penny Opera” as Lucy at CCM. You’ll see her next in “Les Miserables” as Madame Thénardier. Collin Kessler as Leo Frank was understated and subdued in “Parade” at The Carnegie and I found it wonderful. His wife was played by the marvelous Jenny Hickman, who was also great in CCM’s “Carrie.” Kessler will be Inspector Javert (he’ll share the role with Noah Ricketts as its been double cast) in “Les Mis.” Speaking of “Carrie,” I couldn’t imagine a better turn than the one given by Hannah Freeman as the title character. She made me cry more than once. Finally, Max Clayton’s tap dancing and general warmth on stage made “Singin’ in the Rain” THE musical to see this November. Clayton, Hickman, Freeman, and the rest of their cast will all shine in their Senior Showcase both here in town and in New York City this spring. Other notable performances this year for me included DJ Plunkett in “Big River” on the Showboat. In spite of an average supporting cast, he transformed into his dream role of “Huckleberry Finn” with some sort of magical ability that made me believe I was actually seeing Huck Finn on that small stage. It was stunning. Brent Vimtrup, his fellow Shakespearians, and a couple of Xavier students made “The Crucible” not-to-be-missed. I had already seen CCM’s version and while it was well done, the CSC/Xavier co-production was a treat to watch. I finally “get” “The Crucible” and how powerful a play it is after seeing the equity actors bring it to life. No one could ignore the amazing work of Reggie Willis in The Clifton Players production of “The Whale.” Underneath a ton of weight and a whole lot of makeup, he managed to make a 600-pound man sympathetic without being schmaltzy. I love the work of playwright Samuel D. Hunter; he tackles issues of faith, religion, and life in a way that looks at all angles without taking sides. Willis as the central character in this piece was simply magnificent. There were a couple of things that I saw that you probably didn’t but you should have. Unity Productions’s Jon Kovach (along with Billy Chace from CSC) produced two free “Barebones Readings.” The first was two short plays; “The Boot” by Ron Jones and “The American Century” by Murphy Geyer. I thought Mike Dennis was especially great and I’m excited to see him (and Christine Dye among others) in the upcoming production of “Other People’s Money” at New Edgecliff Theater. The other reading was of “Lobby Hero” by Kenneth Lonergan. I thought this was a fun little piece of theater and the actors did a fine job in spite of sitting with the script in front of them and no set. I had the privilege of seeing recent Wright State graduate Benjamin Miller’s new play-in-development, “Lightbulb” in a coffee shop in Dayton. It was funny and unique and it was nice to see a new work from a new playwright. I also made it a point to see “Fake Flowers Don’t Die,” one of the the Playhouse in the Park’s Off-The-Hill shows. This show, while mostly for children, was smartly written and very well acted by the acting interns in the company including Jon Kovach and the engaging Justin Weaks. 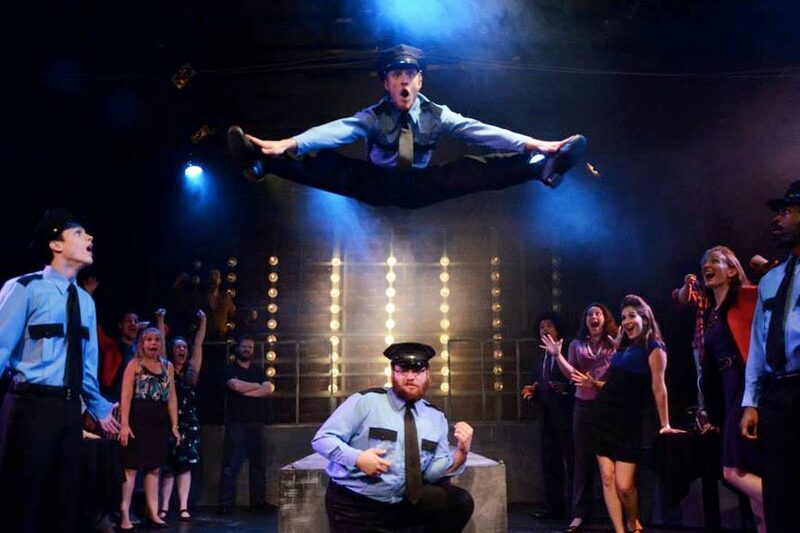 Finally, I made a road trip to Princeton, IL (about 6 hours) to see a production at Festival 56 of “The Full Monty” featuring Ball State student, Caleb Donahoe. This local professional theater uses both equity and non-equity actors and has a great season coming up this year and I hope to make it back out for at least one of their productions. All in all, you can see I had a very busy year, watching and supporting local theater. Below is a complete list of everything (I think!) that I saw in 2013. How many did you make it out to? What are you going to do in 2014 to support local theater? Next week I’ll be previewing some of the great shows coming up over the next couple of months so you won’t have any excuse not to get tickets and see some of the great live theatrical art being produced right here in our region!